I want to create japanese character using IBus Anthy Japan as the input method. The japanese character won’t show as I type, gravit replace it with box. Hello, which font are you using? Support for Japanese characters was somehow introduced with Gravit Designer 3.1, so I’m wondering why it doesn’t work for you. yes, i got it from there. is the input method matters? i choose the wrong font. Glad that everything worked in the end. But together with Georgian glyphs, Japanese glyphs still appear as squares. I use Hiragino Maru Gothic, an Apple computer font and a Japanese font. 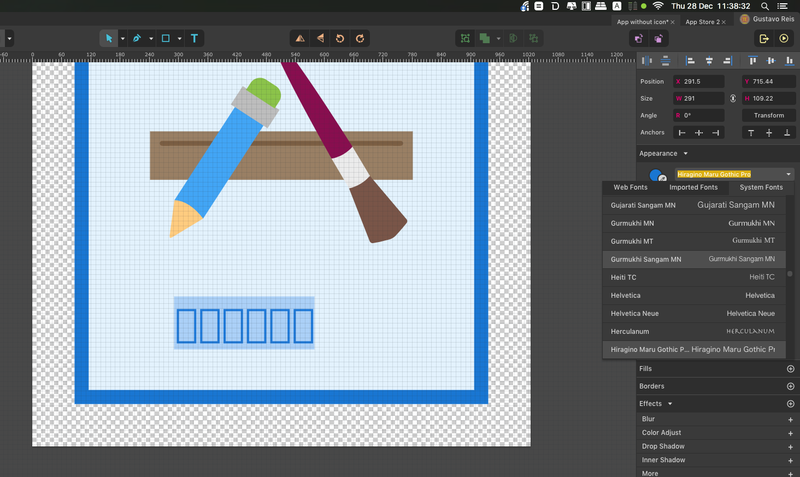 I use Gravit Designer 3.2.63 on macOS Sierra 10.13.2. The solution is that if one font doesn’t have Japanese glyphs, Gravit should fallback to another font which supports Arabic, Armenian, Chinese, Georgian, Greek, Hebrew, Japanese and Korean. The question is how to access these glyphs on a keyboard when Japanese isn´t the preferred language on your Mac in the system preferences. I just used copy&paste from an online translation tool. @EllenM, but I also have done it when I have switched to Japanese keyboard, and they still have appeared as squares. Have you tried to copy and paste a phrase then already like this :" ドミオアリガトウゴザーマス"? I´m now curious if your system is able at all to display Japanese text. Does is work in your browser and if so in the browser version of Gravit Designer? Could you please try to download Noto Sans CJK JP from https://www.google.com/get/noto/ and try to import it from File > Import > Add fonts… in the menu bar? When choosing the font in the font list the Japanese characters should be displayed correctly. @EllenM, Sorry, I went to bed. The browser version of Gravit Designer doesn’t have “system fonts”. @christian.krammer, as I have said to Ellen, the non-Latin fonts work only when I import fonts in the desktop version of Gravit Designer. They do not work when I select system fonts. So I had to import Hiragino Maru Gothic and any non-Latin fonts, including Georgian and Noto CJK. Alright, I’ve created an internal bug report. We will take a look at it. Hi there! I am also having trouble getting Japanese characters to appear. I am using the latest version of Gravit designer (I believe its 3.3.1) and imported the Noto Sans CJK from google as suggested above. When I copy-paste from an email or from google translate it still just shows boxes. Any suggestions are appreciated! Thanks for reporting. This is a known issue and already tracked here. We have just released version 2019-1, and this issue should be fixed now.